Norwest and Hills businesses should look for Art Attack’s new specials postcard in their mailbox over the next few weeks offering great discounts for Spring only. Over 5000 businesses in Castle Hill, Dural, Baulkham Hills, Bella Vista, Winston Hills, Seven Hills, Kellyville and West Pennant Hills will receive the special offers for website, e-marketing and logo services as a local promotion. 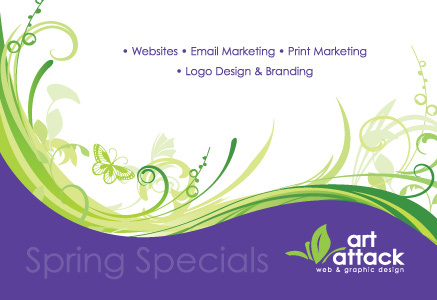 The offer is available to our online visitors too – just ask us about our Spring Specials for up to $100 off web packages, $200 off logo packages or half price set up for e-marketing available until 1/12/09. Conditions apply. Art Attack’s stall at the Sydney Women’s Network Hills Expo on August 19 was a huge success. Along with many other SWN Members, Art Attack showcased our products and services to the general public in the Hills and Norwest areas, including our new Art of Email e-marketing product which was extremely well received by visitors. Art Attack’s Paul and Fiona at the SWN Expo.